Mood Smiley Face Stress Balls and Mini Mood Stress Footballs are great visual reminders for advertising your promotional message. 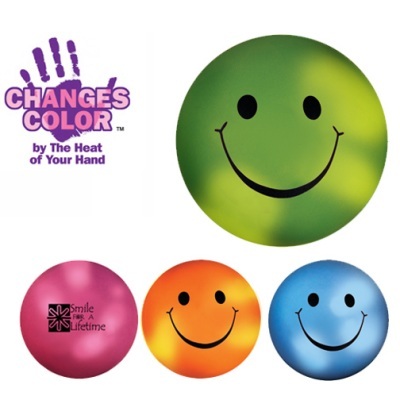 These stress balls are a big hit because of the color changing by the heat of your hand. These products are Tariff Targets and prices may change. Contact us for current pricing. Mood Stress Balls are a quality promotional product for college campuses, radio stations, retail businesses and family service organizations.Your personal advertising message is imprinted on 1-side. 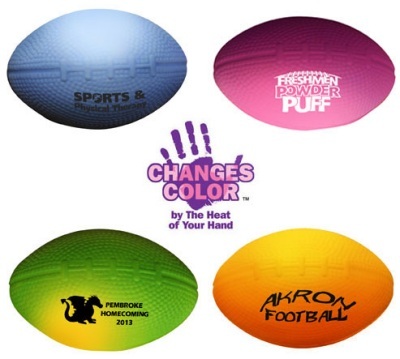 Additional charges apply for a 2-sided imprint available on Mini Mood Stress Footballs only. Contact us us at 706-374-0710 for additional pricing. Colors Available for Mood Stress Balls are available in blue to light blue, purple to pink, green to yellow, orange to yellow. Standard Imprint Colors provided at no extra charge: Black, White, Red, Lt. Blue, Med. Blue, Dk. Blue, Lt. Green, Med. Green, Dk. Green, Brown, Purple, Yellow, Teal, Orange, Maroon, Gold, Athletic Gold, & Silver. BLACK IMPRINT IS RECOMMENDED on our Mood Stress Balls. Mood Smiley Face Stress Ball is 2-1/2″ diameter with a 1-3/8″ imprint area. Mood Smiley Face Stress Ball has smiley face stock imprint on 1-side. Mini Mood Stress Football is 3-1/2″ long with a 1-1/2″ wide x 3/4″high imprint area on a textured material. Made with stress squeeze material that may vary in color and density. Warning: Severe weather conditions may effect the mood color change.